An understanding of the farm system is most important for the rural valuer being the subject of the valuation. The "valuation system" is the method of determining the market value of the rural property. The valuation system is covered generally, in order of the components for carrying out of the valuation so that this part will cover property identification and capability assessment. In recent years there has been a growing awareness and concern within the community for rural land uses to be more accountable and environmentally responsible. 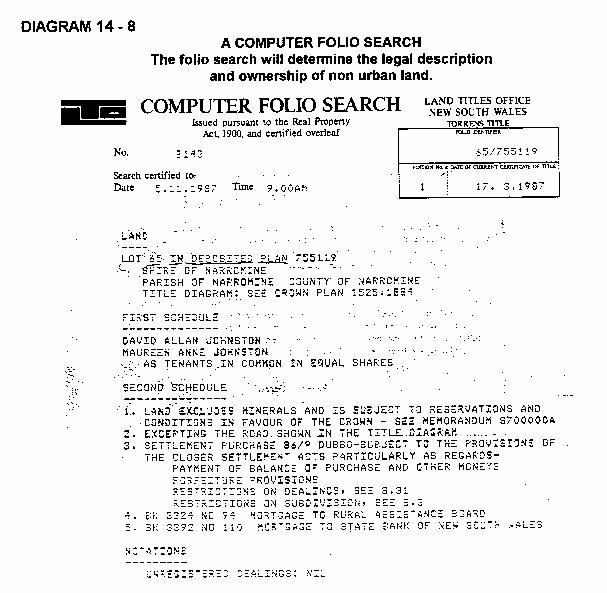 This has led to government regulation and control for example in NSW, the use of Crown lands are controlled under Part 3 of the Crown Lands Act, 1989. Under the provisions of the Act, it is a requirement that a land assessment be conducted for all Crown lands that are subject to sale, lease, reservation or dedication. The same process is suitable for the rural valuer to assess the land capability of all rural lands. Establish the legal boundaries of the subject propertyon a cadastral map using the legal description. Identify farm system components of value on the legal outline using air photos, photomaps and full colour topographical maps. Determine the land capability of the subject property. This is a measure of the ability of the property to accept a land use without adversely affecting its long-term viability. It is based on the natural resource attributes of the land and the functions of the land use, and provides an index of sustainability for each use evaluated. Legal description consists of determining the legal identifiers of the property. These are usually crown identifiers such as Parish Portion in County name (NSW, Victoria, Queensland) or Lot Number in Hundred name, County name (SA). 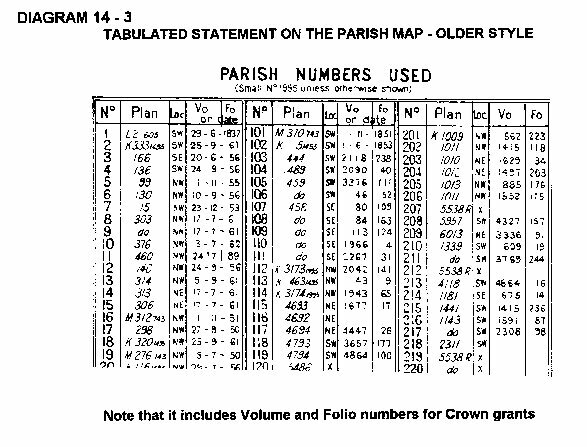 NSW has given unique lot identifiers to the old parish portions and a deposited plan numbers to parish maps. This means that parish portions are now identified in the same manner as for private lands (ie Lot number and Deposited Plan number). If the subject property has been recently subdivided or resurveyed they will be identified by way of Land Title Office identifiers which are usually a Lot number in Deposited Plan number. Once the legal identifiers are known they are plotted on a cadastral map such as a Parish map in most states or the One Hundred map in South Australia. A copy of the Parish or Hundred map can be obtained from the Department of Lands, Central Mapping Authority (NSW) or Mapland (South Australia). subdivision boundaries of local government, electorate and regional areas. Each county is divided into a number of smaller areas called parishes. 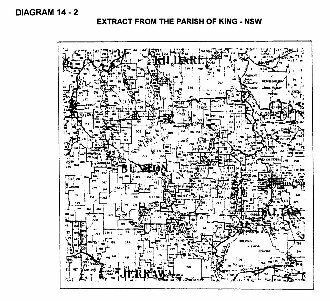 The diagram above shows an extract from the County of King. In heavier print and marked by line and dot boundaries are some of the parishes in that county. 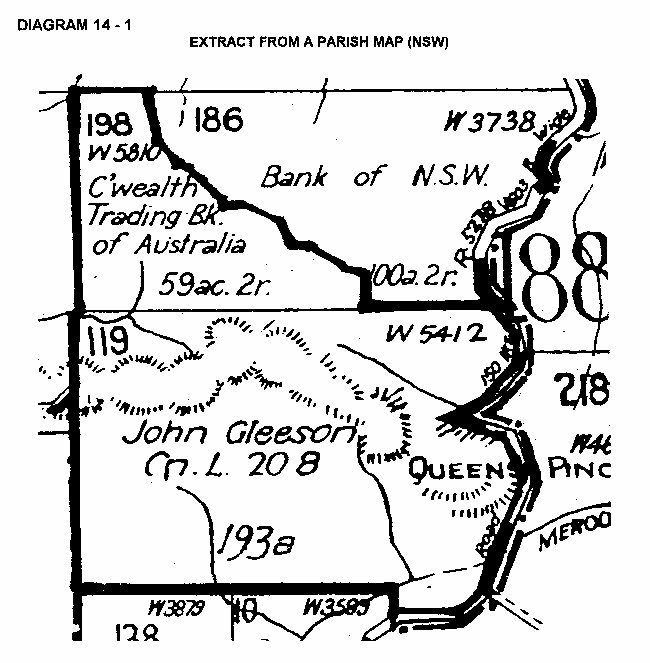 Parish maps have not been compiled for land in the Western Division that is, over that area roughly west of a line from Mungindi to Balranald, or for land within the Australian Agricultural Company's 646 640 acre grant in the County of Gloucester. portions), the numbers of which are shown on the map face There are more lots in a closely settled area than in some of the more sparsely occupied parts of the State. The South Australian system is lot number in a Hundred. The diagram below shows an extract from the Hundred map of Kondoparinga. The Queensland system is also Parish and County as shown in for the Parish of Auburn. When a town lies within a parish, its location is indicated but relevant information is shown on a more detailed scale in a town or village map. The breakdown is usually into sections and allotments rather than portions. 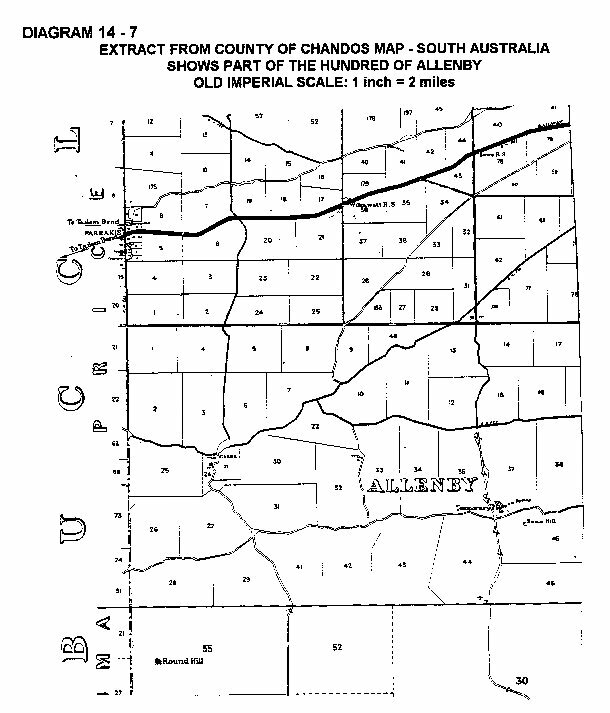 Maps are not produced for "private" towns which have been subdivided out of privately owned land. In recent years portions, allotments and sections have given way to the better known real property system terms; lots within deposited plans. into lots, areas of each lot, plan of survey catalogue numbers (eg W3738 for Lot 186) and grantees names (eg Bank of NSW for Lot 186). 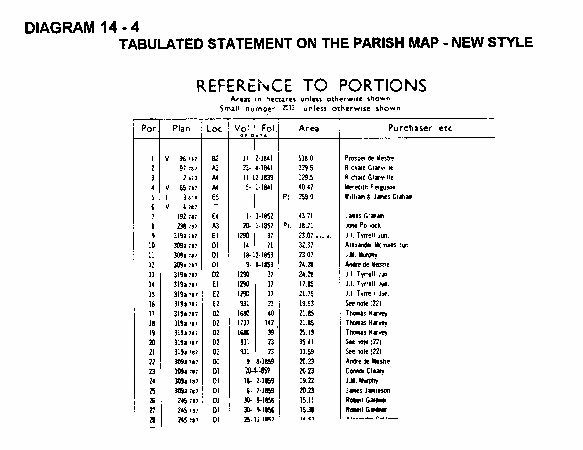 The majority of parish maps are still in imperial measurements so confusion with metric must be avoided. Areas are normally expressed in acres, roods and perches (eg 100 acres 2 roods for Lot 186). A plan of survey has been compiled for each portion and for each town/village section. As well as showing distances bearings and other survey data these usually contain a condensed history of the particular parcel of land albeit in a somewhat cryptic format. All plans are now on micro film and are accessible at the Land Titles Office. 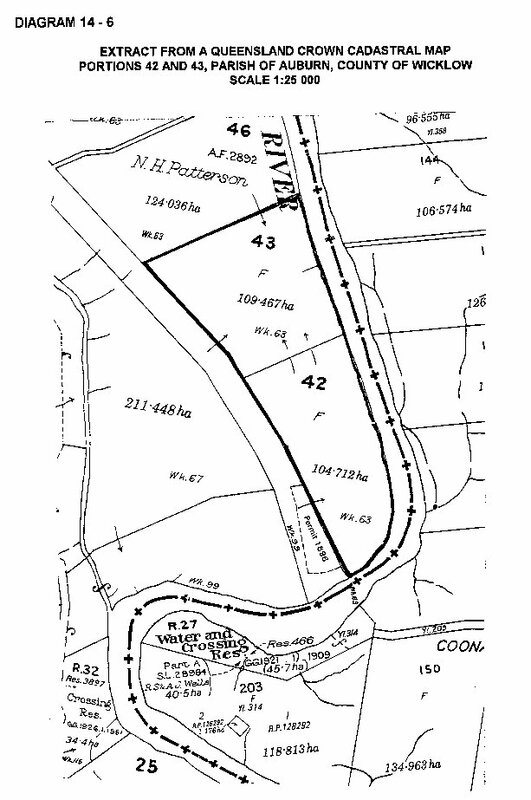 The plan number is noted on the portion for example, Plan Number W3738 for Lot 186 in the NSW Parish example (W stands for the County name; Wellington). The term ''grantee' is used to include the beneficiaries of free grants, grants upon purchase, grants upon completion of conditions (for example, Conditional Purchase), and leasehold grants. The term "first holder" denotes the person by whom a lease, or land still in the course of purchase was taken up. The parish map shows for granted land; the name of the grantee and for leaseholds or current purchases; the name of the first holder. The map does not go beyond issue of the Crown grant. Subdivisions occurring after grant are recorded on deposited plans at the Land Titles Office. The parish map is not updated in response to any such event. That is, once "alienated" the Department of Lands loses jurisdiction over the land. In most cases, the tabulated statement on the parish map gives a volume and folio title reference which is sufficient to enable access to be gained to the Crown grant held by the Land Titles Office. Should this information not be shown, the name of the grantee and date of grant will be sufficient. Sometimes, it will be necessary to get these particulars from the survey plan. Current tenures (leases and incomplete purchases) can be readily identified from the parish map. and then searched at the Land Titles Office. To search behind a grant, prior title identification may be gained either from the original grant or from the survey plan. 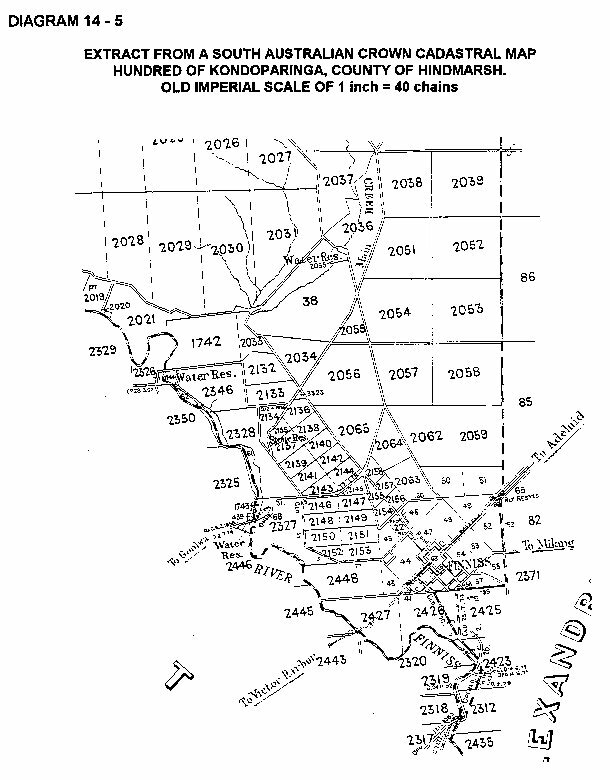 There has been a multiplicity of Crown tenures over the last century as is shown later. At the Land Titles Office (NSW), a Purchasers and Vendors Index lists all land dealings prior to 1863. After 1863, all dealings were recorded in a Purchasers Index only. Both Indexes are accessed on a name and year of purchase basis. The searcher trying to identify a particular landholding or seeking maps of a particular locality should be careful never to discard any fragment of geographical information, however insignificant it might appear. The Lands Map Sales and information Centre possesses a place names list which is, in its own right an historic document. It lists alphabetically all place names that appear on Eastern and Central Division parish maps. There are an estimated 22 500 entries in this list. It does not include the County of Cumberland. The mortgagee will appear as grantee if there was a mortgage existing at the time of issue of the grant (this was the system before Torrens Title). This accounts for the high incidence of Banks' names on every map. The grantee may not have been the original selector. The land could have changed hands many times between selection and grant. Original selection may have been under lease many years ago. Conversion in recent years to a purchase could result in the first holder's name being deleted and replaced by the first holder of the new purchase tenure.